"I bake with my three-year-old at least once a week. We have tried a plethora of different cookies with different fruits and bases. This one was a hit! My three-year-old and older child both loved these, and I did too! They are super simple to make and sneak fiber, protein, and other nutrients into dessert! I used one cookie sheet for nine cookies, three rows of three fit well." Bring water and quinoa to a boil in a saucepan. Place a cover on the saucepan, reduce heat to medium-low, and cook at a simmer until the moisture is absorbed completely, 15 to 20 minutes. Mix cooked quinoa, coconut, oats, flour, brown sugar, mashed bananas, applesauce, peanut butter, vanilla, salt, baking soda, and baking powder together in a large bowl. 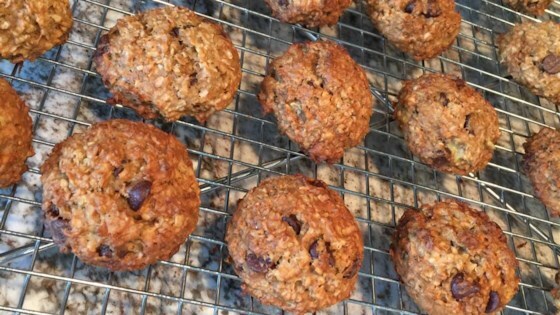 Fold chocolate chips into the quinoa mixture; drop by spoonful onto prepared baking sheets.